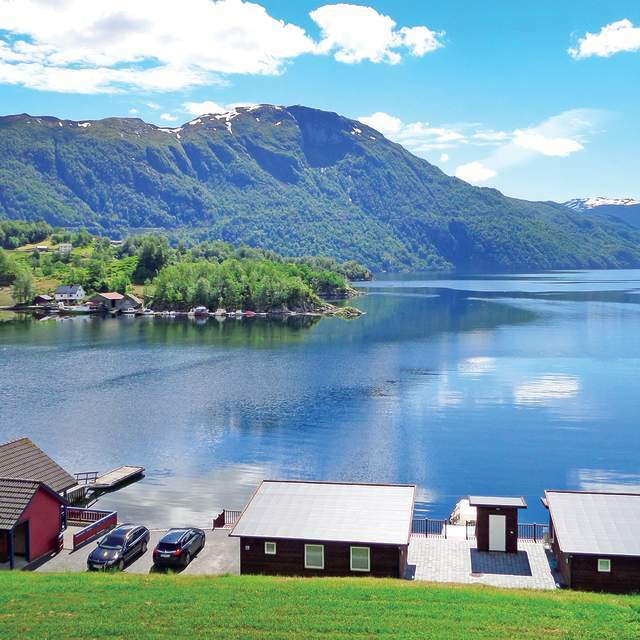 NOVASOL offers more than 50,000 holiday homes across Europe, and 1,700 of them are located in the mountains, in the cities, and by the fjords of Norway. Wherever you decide to go in Norway, you won’t have to travel far to find untouched nature. Explore the majestic mountains and vast plains, the deep forests and the lush valleys. Southern Norway is full of islands and coves, white wooden houses, and terrific beaches. During summer, the region is a paradise, famous for its cozy cities, great seafood, and relaxed atmosphere. The holiday homes provided by NOVASOL in southern parts of Norway lies in charming surroundings, often with access to a boat. In the far north you’ll find the almost endless Finnmarksvidda mountain plateau, which is full of magic, ancient culture, and some of the best salmon rivers you could imagine. Northern Norway is also home to the amazing islands of Lofoten, with their picturesque mountains and surroundings. A NOVASOL holiday home in Strandebarm, Fjord Norway. A NOVASOL holiday home in Austevoll, Fjord Norway. A NOVASOL holiday home in Sjusjøen, Eastern Norway. A NOVASOL holiday home in Sveio, Fjord Norway.
. From a holiday home in Fjord Norway you also get some of the best fishing opportunities in the country. The mountains attract visitors throughout the year. A number of NOVASOL’s cabins are located by popular ski resort, others lie smack in the middle of the beautiful nature. Go skiing during Easter, fish at a mountain plateau in the summer, or experience the magical colours of autumn in the mountains. In the cabins offered by NOVASOL, the whole family are invited to eventful holidays no matter when you decide to visit. The mountains attract visitors throughout the year. A number of NOVASOL’s cabins are located by popular ski resort, others lie smack in the middle of the beautiful nature. Go skiing during Easter, fish at a mountain plateau in the summer, or experience the magical colors of fall in the mountains. In the cabins offered by NOVASOL, the whole family are invited to eventful vacations no matter when you decide to visit. If you want to stay in a holiday home with full freedom on your trip to Norway, try renting an apartment. Choose between self-catering and serviced apartments.